Copyright: © 2018 Sürme MB, et al. This is an open access article distributed under the Creative Commons Attribution License, which permits unrestricted use, distribution, and reproduction in any medium, provided the original work is properly cited. Cranioplasty is a reconstructive procedure for the repair of skull defects or deformities. Polymethyl-methacrylate (PMMA) is a commonly used alloplastic material when autologous bone is unavailable. However, manual shaping of bone cement for frontal and orbital bone defects is challenging and may not lead to cosmetically satisfactory results. Advances in computer-aided 3-dimensional (3D) design and printing technology allow the production of patient-customized implants with improved cosmetic and functional results. A 39-year-old female patient presented with right-sided frontal swelling and headache. Computerized tomography (CT) demonstrated a right frontal calvarial mass extending to the orbital wall. The boundaries of the lesion were marked using a 3D design software. A polyethylene terephthalate glycol (PETG) mold was manufactured with help of a 3D printer. Artificial bone flap was formed by pouring PMMA into the mold. After surgical resection of the calvarial mass, customized PMMA implant was applied with titanium mini plate and screws. The defect was closed properly with good aesthetic results. Production of customized PMMA cranioplasty implants with 3D printed molds is a useful technique and can be preferred for calvarial defects due to skull tumors, bone resorption and traumatic bone loss. Cranioplasty is surgical repair of skull defects or deformities with autologous bone graft or alloplastic materials. The main indication for cranioplasty is a calvarial defect due to a previous decompressive craniectomy, a common surgical procedure for the treatment of intractable intracranial hypertension . Other clinical conditions that may result in skull defects and require cranioplasty include skull tumors, bone resorption, infection, and traumatic bone loss . Cranial bone reconstruction may be conducted using autologous bone, non-metal or metal allografts. 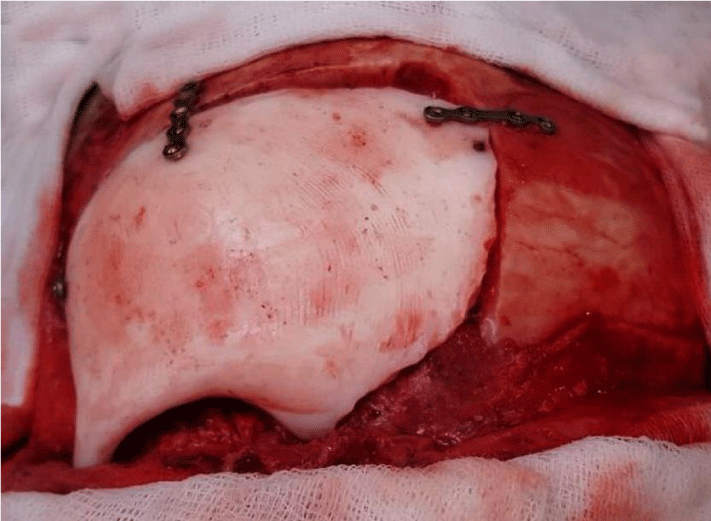 When performing decompressive craniectomy, autogenous bone flap obtained at the time of the procedure can be placed in abdominal fatty tissue and used in subsequent cranioplasty. If the craniectomy flap is unavailable due to conditions such as a calvarial neoplasm or bone loss, rib bones like autografts can be harvested for autologous bone graft. However, when a large skull defect or autologous bone resorption is at present, autografts may be insufficient for achieving good cosmetic outcome and cerebral protection [3,4]. Currently, non-metal and metal alloplastic materials including polymethyl-methacrylate (PMMA), hydroxyapatite and titanium meshes are widely used as cranioplasty grafts . Although the use of these materials allows closure of large cranial defects, time needed for preparation, shaping and the contouring of the implant increases the duration of surgery. Moreover, defects close to the orbital walls and skull base constitute a challenge due to their complex shape and borders, compared to calvarial convexity, it is more difficult to achieve satisfying cosmetic results. Another problem encountered with acrylate grafts is the excessive amount of heat, generated by exothermic reaction that occurs during the preparation process . Preoperative cement preparation is an alternative technique to avoid time consuming and adverse effects of intraoperative preparation. Preparing the graft prior to surgery enables the surgeon to tailor the borders and shape of the graft according the defect size, improves cosmetic outcome, minimizes duration of the surgery and prevents heat-related complications. We present and discuss a highly cost effective, patient-tailored and cosmetic graft preparing method using 3-dimensional (3D) modelling and printing technology. Thirty-nine-year-old female patient presented with complaints of headache and a growing palpable mass around right forehead and right eye. Neurological evaluation was not remarkable. Physical examination revealed a hard and immobile mass on right frontal region and upper orbital wall. 3D Computerized tomography (CT) showed sclerotic thickening of right frontoorbital calvarial bone with hypodense nodular lesions. Internal tabulae of right frontal bone was also eroded and there was an extra axial calcification with a size of 17x10 mm (Figure 1A). Figure 1: Preoperative (A) 3D CT and (C) Meshmixer software images of calvarium showing sclerotic thickening of right frontoorbital calvarial bone with narrowing of the orbital cavity. Postoperative (B) 3D CT and (D) Meshmixer software images of calvarium with patient-tailored PMMA implant. Following the resection of the lesion, frontal convexity, orbital roof and a part of the zygomatic bone is reconstructed with the prefabricated bone graft. Axial spiral computed tomography (CT) scans with 1-mm thickness were obtained (Philips Brilliance 64 Slice CT, Philips Healthcare, Best, The Netherlands) and Digital Imaging and Communications in Medicine (DICOM) data were converted to Stereolithography (STL) format via InVesalius 3.0 (CTI- ProMED, Brazil) software. This format was transferred to the MeshMixer (Autodesk 2017 Inc.) software and a 3D image of the skull was generated (Figure 1C). The borders for the adequate resection of the pathological bone were marked. Referring these borders, a 3D mold model was designed and the data was transferred to 3D printer. Using a 3D printer, a polyethylene terephthalate glycol (PETG) mold was prepared. The mold consisted of three pieces and average printing time was 30 hours (Figure 2). 2 packages of 40 mg antibiotic coated PMMA were mixed and poured into the mold. Following the hardening of the material, the mold was removed and prefabricated PMMA graft was acquired (Figure 3). It was sterilized in steam autoclave at 136 °C. Figure 2: PETG mold generated by a 3D printer. In order to create a solid implant containing orbital roof and part of zygoma, a three-piece mold was designed. (A) Closed, (B) Opened. Figure 3: (A) Anterior and (B) posterior aspects of PMMA implant. Intraoperatively, a bone mass extending to superior posterior orbital wall was exposed following a bicoronal skin incision. The lesion was resected using a high speed drill along with a part of frontal bone and superior and posterior aspects of orbita. Then prefabricated PMMA implant was placed on defect and stabilized with titanium mini plates and screws. A good reconstruction of frontal convexity and orbital walls were achieved (Figure 4). Following hemostasis, the layers were sutured, no complication occurred during surgery. Postoperative observation and palpation showed no remarkable asymmetrical appearance around periorbital and frontal regions. Visual examination was normal. Figure 4: Intraoperative application of PMMA implant. Postoperative 3D reconstructed CT imaging revealed total excision of the lesion and successful closure of the defect with PMMA implant. No asymmetrical appearance was noticed when compared to left frontal and orbital bones (Figure 1B and D). The patient was discharged on the 4th day postoperatively with no additional complaints. Histopathological evaluation was consistent with Paget’s Disease. Successful reconstruction of large calvarial defects is a challenging task. The reconstruction of cranial bone defects has great importance for the protection of the brain and vital structures. Besides the functional aspects of the procedure, aesthetics should be considered as well by cosmetic restoration of the cranial contours . Although autologous bone is the optimal choice as a bone flap, due to factors as bone resorption and infection, it is not always available . When it is not possible to use an autologous graft, alloplastic metal and non-metal materials constitute a good alternative to repair the defect. Each material has its own advantages as well as its drawbacks. Use of synthetic bone materials allow the reconstruction of large defects and avoid problems regarding the donor area. Autologous bone grafts may prevent allergic reaction and implant exposure, but disadvantages include donor site morbidity, prolonged surgical time, unpredictable resorption, and asymmetrical bone shape [2,7]. PMMA is one of the widely used and most common alloplastic materials for cranioplasty implants due to its long established use, easy preparation and shaping properties and low cost . However intraoperative fabrications of PMMA grafts are associated with longer duration of surgery and relatively poor cosmetic results. In addition, during hardening of PMMA material, an exothermic polymerization reaction occurs. There are two potential problems regarding this reaction: First, due to occurrence of toxic monomers, there is the risk of local and systemic reactions . Second, when the PMMA implant is directly applied on the defect area, excessive heating and damage to dura and underlying parenchymal tissue is possible . To avoid the problems associated with intraoperative PMMA casting, preoperatively designed patient specific implants were introduced. With the aid of 3D design and printing technology, the size and shape of the defect determined from imaging data can be transferred into a planning software to produce a patient-tailored implant [10,11]. We used CT scan images for computer aided design, which allowed a smooth surface rendering of 3D cranium model. A 3D image of the skull was generated and the borders of the adequate resection for excision of the pathological bone were marked. Using a 3D printer, a PETG mold was prepared. Due to complex shape of frontoorbital region, we used a PETG mold consisting of 3 pieces. Polyethylene terephthalate (PET) is one of the commonly used plastic materials among the world. Direct food contact of PET is approved by FDA and it can be used as water and food container. Additionally, PET is also used in health industry as knee ligament or vascular prostheses because of its biostability and biocompatibility . PETG is glycol-modified version of PET to achieve a clearer and stronger structure. PETG is a widely used, inexpensive substance for 3D printing. Since the substance is not autoclave-resistant, we first prepared the PMMA implant in non-sterile conditions and then sterilized it in autoclave at 136°C. Defects in frontal bone are more difficult to restore when compared to lateral temporal or parietal bones due to frontal region’s more convex structure and its relation with orbital roof. Besides, as a non-hair-bearing and directly visible region, to achieve a good aesthetic outcome is extremely important for patient’s well-being and confidence . For the present case, not only the frontal bone, but also the upper lateral and posterior roof of the orbit were invaded by a large calvarial mass. Therefore, obtaining an appropriate frontal convexity and a smooth orbital roof via intraoperatively prepared PMMA would be either very time-consuming or very difficult. Since the resection of upper and posterior orbital walls was necessary, a misshaped implant could have resulted in exophthalmic or enophtalmic deformity. When taken into account that the major complaint of the patient was a visible, progressively growing orbital mass, it was of significant importance to achieve a good cosmetic outcome to meet the patient’s expectations. Regarding the above mentioned drawbacks of intraoperative PMMA casting such as infection, prolonged surgery duration, toxic and heat-related effects, we preferred to use a prefabricated PMMA implant. There are different mold preparation methods reported in previous studies. Kim et al. , casted PMMA between a 2-piece mold, whereas Tan et al. , generated a 1-piece mold and applied PMMA directly on it. In order to achieve only one-piece of frontal bone model with upper posterior and lateral wall of the orbit, we used a 3-piece mold. Another alternative would be the prefabrication of frontal bone and orbital walls separately and assemble the pieces with mini screw and plate system. Despite being more challenging in design process, we preferred the first one to create a more stable and cosmetic implant. During the surgery, prefabricated implant was applied on the defect with minimal trimming and stabilized with 5-7 mm mini screws and mini plates. Reconstruction of posterior orbital wall and frontal convexity was very satisfying as it was confirmed by postoperative CT scan. This technique was not only time saving, but also prevented direct contact of PMMA to the duramater and the eye globe. It should be kept in mind that any measurement error that can be made in the mold preparation technique with the 3-D printer can prolong the surgery period and change the planning. 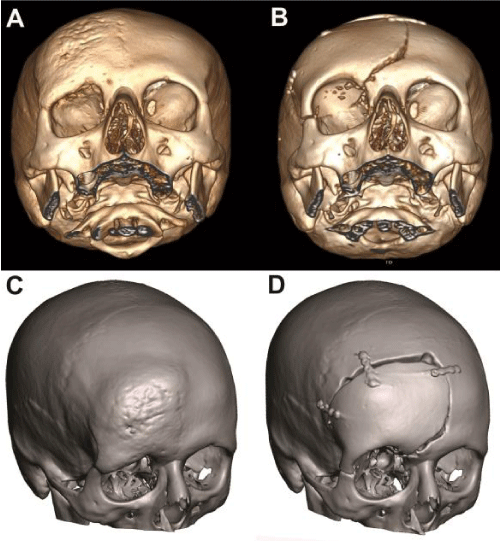 In conclusion, the progress in 3D design and printing techniques allow the surgeons to construct patient-tailored cranioplasty implants, where the use of autologous bone is not possible. Such individualized materials help avoiding potential complications of intraoperative PMMA fabrication, such as local and systemic toxic effects, dural and parenchymal damage, while decreasing operation time and ensuring excellent cosmetic results. The authors would like to thank Mr. Kemal KOYUNCU and Mr. Yahya CERRAH for their kind suggestions and help in 3D design and printing process.